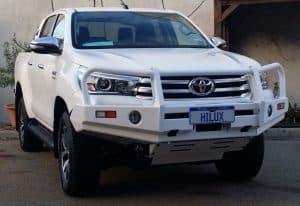 Do you want to know where to get bull bars in Perth? At Midland Towbars of course! At Midland Towbars, you can access the biggest range of industry-leading alloy and steel Frontal Protection Products [Bullbars / Nudge Bars / Roo Bars] AND an expert, qualified fitting service. We are the bull bars Perth experts so Come and check out the biggest range of Bullbars in Perth! We all want to travel, and we all are planning [or dreaming] of our next trip to ……… Well, I know I am! I am constantly hearing stories of our customers who are on the road all over Australia and have got to their destinations ‘safely’. We have even heard the stories of those who have ‘met’ Mr or Mrs Kangaroo or Sir Big Cow of Outback Pastures and while the pictures weren’t pretty, they have lived to tell the story! Australia, home to some of the toughest terrain out there, is why you need to think seriously about protection. At Midland Towbars, we take your safety seriously and we look at supplying and fitting the best looking, safest, most rugged and well-engineered bullbars available to suit your vehicle. We want to provide strong and stylish frontal protection products [Bullbars / Nudge Bars / Roo Bars] that are made to last, and that will keep you ready for any challenges you encounter – on the road or off it! We have access to Nudge Bars / Roo Bars / Bullbars from all over the country, so we’re sure to find you something that’s tough enough and looks good on our new modern vehicles. Not only good looking, but our huge range of Frontal Protection Products [Nudge Bars / Roo Bars / Bullbars] are all air-bag certified, air-bag compatible, have specifically engineered mounting systems, LED park/indicator lights, wont affect your new car warranty, meet the 5-star safety ratings and are suitable for front sensors [where this feature is applicable]! For bullbars in Perth you can count on choose Midland Towbars today.